Access to pure, clean drinking water is a necessity for healthy living.It keeps you hydrated and is good for overall health. You may not like the tap water at home, whether it’s due to the bad taste, or because you’re worried about contaminants in it. Another convenient and economical option which supplies you with clean, contaminant-free, better tasting water, is using a water filter pitcher.It’s important to find the best water filter pitcher to suit your needs. 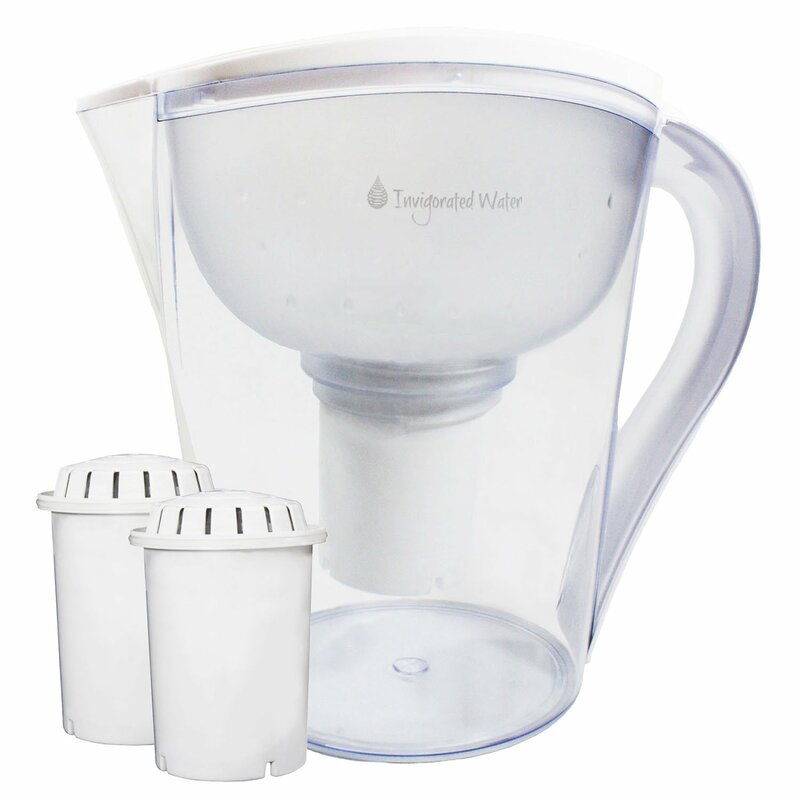 A water filter pitcher is a large jug that contains a replaceable water filter which removes contaminants from the water, leaving it pure and safer to drink. It is gravity-fed and made up of two compartments, one smaller and one bigger. When you pour the water into the top, smaller compartment, it drains via gravity through the filter, where contaminants are removed, to a second larger compartment below. Having a water filter pitcher is beneficial in many ways. Firstly, it enables you toquickly and easily have immediate access to clean, pure drinking water, that can be kept cold in the fridge. The jug is easy to carry around your home, to a new home, or can even be used for travelling. Secondly, filtered water should have a more pleasant taste than regular tap water, which means better tasting drinks whether it’s a glass of plain water, or if it’s used for hot drinks such as coffee or tea. What's more, it’s the most affordable and convenient option in terms of a water filtration system and should be simple to use. The pitchers are generally easy to clean and maintained. New filters are easy and relatively cheap to purchase. Another key benefit of the pitchers is that they are environmentally-friendly and economical, as they save the use of lots of plastic bottles. There are various factors that need to be considered before purchasing a water filter pitcher such as its effectiveness, ease-of-use, design, size and price. There are many different brands and models of water filter pitchers available on the market. Depending on the model, it can have different filtering capabilities, filtering speeds and can hold different amounts of water. Take into consideration that a full, large pitcher will be heavier to carry. Instead, you may prefer a lighter pitcher which holds less cups of water. Also, some pitcher models will keep track of when the filter needs to be changed. It’s important to be aware that even though a filter has been certified, this does not mean that all contaminants have been removed, although they have been reduced to a level that is considered safe by the EPA (Environmental Protection Agency). No filter can achieve removal of 100% pollutants. However, a significant percentage of contaminants can be removed (between 50 and nearly 100 percent). Certain models of water pitchers are members of the Water Quality Association (WQA). They certify water filter products that have earned “Gold Seal and Sustainability Certification Marks” after rigorous product testing and checking whether the product is compliant with all industry standards. You can find certification of water pitcher product of your interest on the website of WQA . Some filter systems make the water more alkaline, by reducing the acidity in the water. Regular tap water usually has a pH of 7, whereas alkaline water has a higher pH or 8 to 9. The pH level indicates how acidic or alkaline a substance is on a scale of 0 to 14. For example, water with a pH of 1 would be very acidic, and water with a pH of 13 would be very alkaline. Consuming excessively acidic or alkaline water is harmful, warns the Environmental Protection Agency (EPA). According to EPA standards, drinking water must have a pH value of 6.5 - 8.5. However, we know that a substance with pH of 7 is considered neutral. Water with a pH lower than 7 is considered acidic, and with a pH greater than 7 is considered basic. Therefore, water filter pitchers that help increase the pH level in water can be considered beneficial to our health. With so many water filter pitcher options available on the market, the choice may seem overwhelming. Which brand/model to choose? The following are the five most worth considering water filter pitchers, taking into account all key factors such as functionality and pricing. The ‘pH RESTORE Alkaline Water Pitcher Ionizer’ has an advanced, multi-stage filtration system. The filter consists of a ceramic ball and stone mix, which ionizes the water. It increases the pH of the water, making it alkaline, and purifies it, removing toxins, chemicals and pollutants, whilst adding healthy minerals, such as Zinc and Calcium. This newer model has a modern design and is easy to use. If features a digital indicator, so you can relax and will see when you need to change the filter. It has a large capacity and is also very economical, since it includes 2 long-life filters. 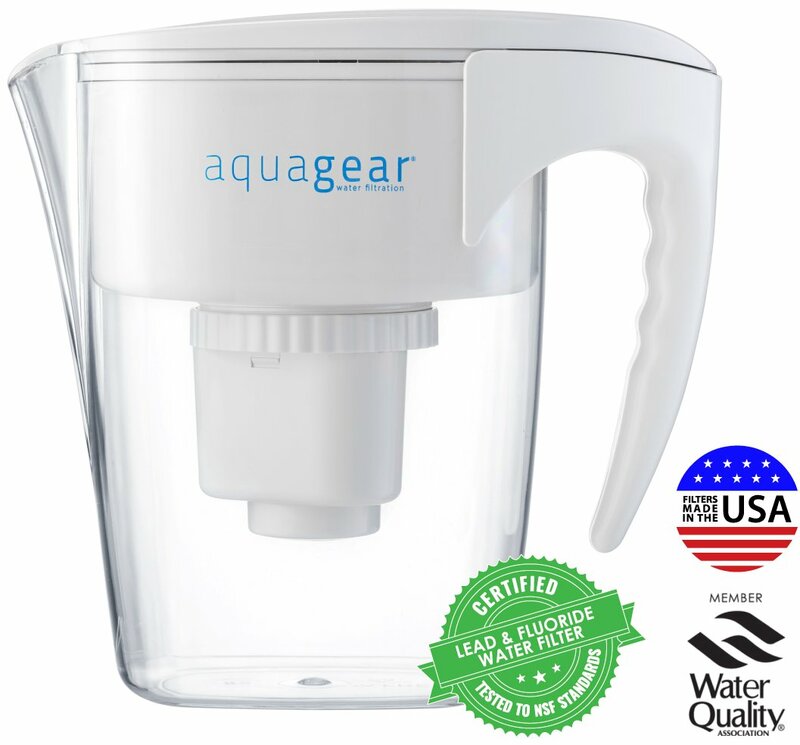 The ‘Aquagear Water Filter Pitcher’ has been rigorously tested and meets and exceeds the NSF standards (1) for a reduction of the most harmful and common contaminants. This includes, a reduction of lead (97.5%), Fluoride (90%), Chlorine (99.99%), Chromium 6 (99.87%) and Mercury (99.6%). Its high-quality filters hold 150 gallons of water each, which lasts three times longer than Brita filters. This is more economical over the long-term and means less hassle. It leaves fresher tasting water. As a reassuring bonus, this 8-cup pitcher comes with a lifetime guarantee, therefore any defect or breakage is covered. The ‘Clear Genius Water Pitcher’ is certified by the WQA (Water Quality Association). It is more environmentally-friendly, as it uses reusable cartridges instead of disposable plastic filters, like other brands. This also makes it more cost effective and the actual pitcher is also a very low price. The pod simply needs replacing. Its unique filter design consists of a “blend of activated carbon and ion exchange resin, all contained within a non-woven shell” which also prevents black specks forming in the water. It removes harmful contaminants without removing essential minerals. The filter cartridge stays firmly in place and the NSF approved “O-Ring” enables a strong, high-quality seal, which stops any leakage. The pod filters 40 gallons of water and the capacity of the pitcher is 6-cups. The pitcher comes in a transparent designand the advanced filtrations system produces fresh, smooth and great tasting water. 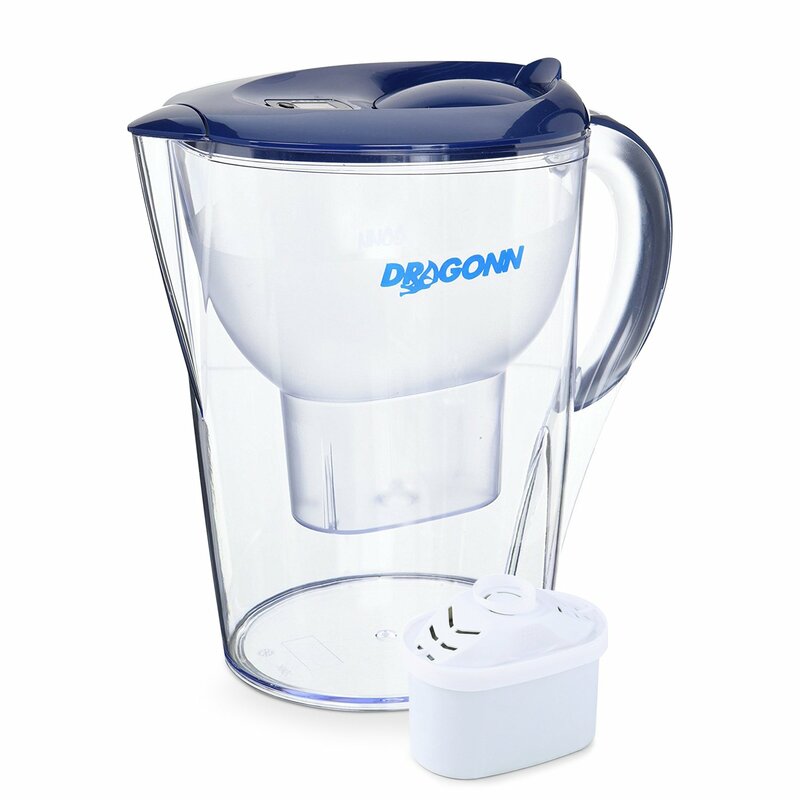 The ‘Dragonn Alkaline Water Pitcher’ contains a 7-stage filtration system to purify the water and to increase pH levels so that the water becomes alkaline.The water also has a more pleasant flavor. The pitcher can hold up to 3.5 litres of water and there is a free premium filter cartridge included. It removes chlorine, odors, heavy metals and 90% of zinc, copper, lead and pollutants. The pitcher is designed well, it is slim so can easily fit in the refrigerator. The lid stays firmly in place when pouring, so no unfiltered water leaks out. It is easy to fill so you don’t have to remove the cover and has a comfortable handle. Another great benefit is that this filter has a faster drip than others, saving time waiting for the water to be filtered. There have been complaints that the water did not become alkaline as advertised. 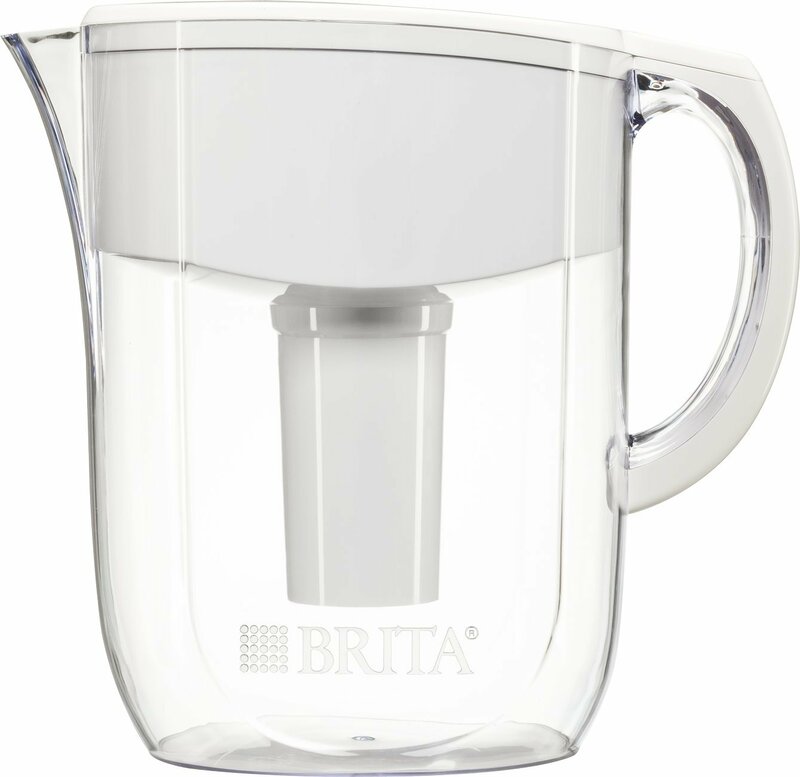 The ‘Brita 10 Cup Everyday Pitcher’has a large capacity, storing a lot of water. It has a sticker indicator to show when the filter needs changing, which is approximately every two months. The product can be set up easily and has an easy to fill lid. It’s an affordable option and comes in a variety of colors and sizes. Brita recently announced its new “Longlast” and “Stream” filters which fit most existing Brita pitchers. “Longlast” holds 120 gallons of water (versus the standard 40) and is certified to remove 99 percent of lead, along with several other contaminants. Some issues reported about the uncomfortable, awkward handle shape. Hard-to-separate components, that make the unit relatively difficult to clean. 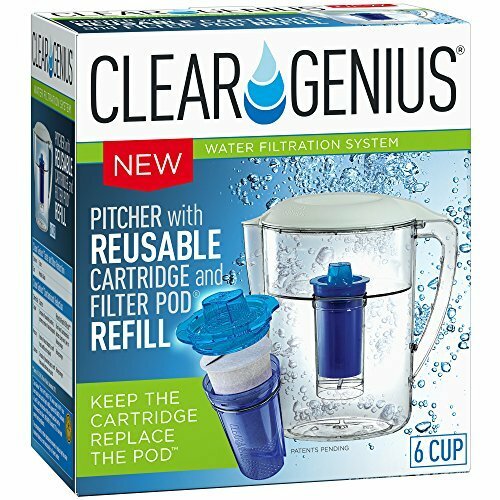 After carefully considering all the advantages and disadvantages of each water filter pitcher, my pick is the ‘Clear Genius Water Pitcher’. It has all the desirable features expected from this type of product, for a low price. Most importantly, it is certified by the WQA (Water Quality Association) and its unique filtration systems removes harmful contaminants to the highest standard, without removing essential minerals. It is also the most environmentally-friendly option, as it uses reusable cartridges with pods, instead of disposable plastic filters. This also makes it more cost effective.